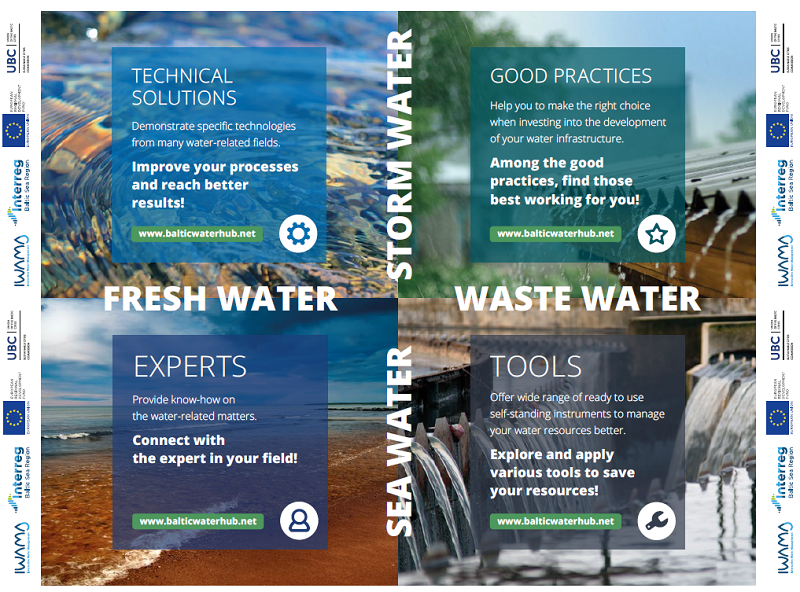 Baltic Smart Water Hub is easy-to-use open web portal showcasing most recent good practices, technical solutions and tools for water sector experts in the Baltic Sea Region. The portal has been developed in the framework of the Interactive Water Management - IWAMA project by the project’s Lead Partner, Union of the Baltic Cities Sustainable Cities Commission. 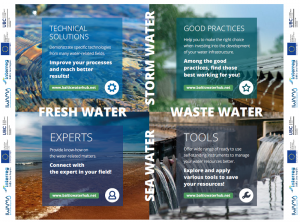 The Baltic Smart Water Hub is a place of technical expertise and a database of exemplary solutions existing in various water sectors in the Baltic Sea Region. The Hub structure follows four water areas, in which the information is presented: fresh and sea water, storm water and wastewater. Through recognizing these areas, the Hub emphasizes important water management aspects such as handling storm waters, river monitoring, lake restoration, coastal area management, wastewater treatment, securing high quality drinking water etc. Through the demonstrated cases, Hub users can find ideas for investments, measures to optimize processes, solutions to similar challenges and tools to use in the daily work. They can also learn about existing funding instruments, regional policy framework and potential networking associates. Users can also submit their own content to the Hub through an on-line form and by doing so promote their organisation´s expertise in the region. The portal offering is continuously expanding with novel tested solutions, providing users the best variety of available water management related information around the Baltic Sea Region. Visit the Hub and share your good practice! Hub is a free-access online portal hosted by the UBC Sustainable Cities Commission. The Hub´s target groups consist of water companies and associations, relevant local authorities’ departments, academia and students engaged in water fields, private companies producing clean-tech and innovative water-related solutions, as well as NGOs and other initiatives and foundations working with water issues. Good practice cases presented in the Hub illustrate processes of implementing investments, piloting or innovative solutions that certain actors have experienced and sharing of which is beneficial for Hub’s target users. From a good practice description you would find who did what and why, over what period of time, what was the result, how much did it cost and where the funding came from. Additionally, good practice might elaborate on a specific setting and prerequisites of the process and influencing regulatory factors. Technical solution describes specific technology that can be used in order to improve a certain process or solve a specific problem. Technical solution is usually offered by a supplier, and you can learn about how exactly it functions, what prerequisites are needed and approximate cost. Brief examples of where it has been implemented and with what results can be found from a solution’s description, or elaborated in more details as a good practice. Tools available via the Hub are self-standing instruments that can be downloaded or reached through the source and immediately applied by the end users. If available, descriptions of the process and results of systematic application of certain tools are described as good practices.